Although there is no one fixed dish served for Christmas dinner in Italy, the general emphasis is on hearty, robust, decadent food. A traditional lasagne with its layers of rich ragù, creamy béchamel sauce, and silky egg pasta ticks all the boxes and can be prepared in large quantities, making it the ideal dish for a big family celebration. The secret to a showstopping lasagne is in the slow-cooked meat sauce which, although simple to prepare, requires a long cooking time to really melt the flavors together. However, the good news is that the dish can be prepared in advance then simply baked in the oven when required. Although homemade pasta is always the best, you can save time by using pre-prepared fresh pasta sheets. As with most traditional Italian dishes, every family has its own lasagne recipe. Here is how we like to make it. To make the ragù heat a large splash of olive oil in a large, heavy saucepan. Finely chop the onion, carrot, and celery, add to the pan and gently fry for a couple of minutes until beginning to soften. Blend or very finely chop the pancetta and mortadella, add to the pan and cook for 2 minutes before adding the minced beef and pork. Season with salt and pepper and cook for 10 minutes until the meat has browned. Add the red wine and continue to cook until the alcohol evaporates before adding the passata. Bring the passata to the boil and then cover the pan, turn down the heat and leave to cook for 3 hours stirring occasionally. If the sauce becomes too thick add a little water and continue to cook. When the ragù is cooked turn off the heat and stir in the milk. Prepare the fresh pasta by placing the semolina flour on a large board or work surface. Make a well in the center and add the eggs. Use a fork or your fingertips to gradually work the flour into the eggs from the outside in. Once the dough begins to take shape, use your hands to knead, pushing into the mixture with the heel of your palm. If the dough becomes sticky add a little more flour. When the dough feels silky smooth and stretches without breaking, cover in a cloth and leave to rest for at least 15 minutes. 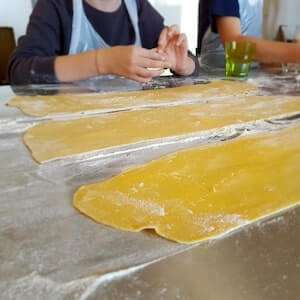 Once rested, use a pasta machine or rolling pin to roll out the dough and then cut into rectangular sheets. Place the sheets on a semolina-floured cloth or work surface and leave to dry out slightly. Make the béchamel sauce by gently melting the butter in a saucepan until foaming, take off the heat and add the flour, mixing well until they are combined in a thick paste. Place back on the heat and gradually add in the milk, whisking continuously to eliminate any lumps. When all of the milk has been added and the sauce is smooth add a generous grating of nutmeg and a pinch of salt then continue to gently cook for about 5 minutes, still stirring, until it becomes thick and creamy. To compile the lasagne, take a rectangular baking dish and spread a little béchamel sauce on the bottom. Then place a layer of pasta sheets, a layer of ragù and a sprinkling of Parmigiano. Repeat for 4 or 5 layers, finishing with a layer of ragù with a generous topping of Parmigiano. (At this point the lasagne can be covered in plastic wrap and kept in the refrigerator until ready to bake; bake within 24 hrs). Preheat the oven to 200°C (180°C fan oven) and cook the lasagna for about 20-25 minutes. It is ready when the top layer is golden and slightly crunchy. If you can manage reading Italian, our favorite cookbook is the Talsimano della Felicità with staple recipes from traditional Italian cuisine. Get the recipe for an authentic Italian Lasagne alla Bolognese. Prepare a delicious lasagne for a large family celebration or do as the Italians do and serve it on Christmas Day.